​ "That's Not Her Style" is a bluesy-rock ode to Christie Brinkley, or at least what the paparazzi may think of supermodels like her. While the media may think she jets across the country and "wines and dines with Argentines and Kuwaitis," she is actually much more down to earth. Billy has stated that the song is "a commentary on all the ridiculous things you read about yourself if you're a celebrity. Ninety percent of what is reported in the press is untrue." And it even gets humorous after a while. It is a theme similar to the one in the song "Careless Talk" from the album An Innocent Man in which Billy laments that "everyone's telling lies, I don't even know why, why can't people find something better to do?" ​When you think about it, Billy's life had changed dramatically from his early years, so much so that he is now writing a song about a supermodel. Yet on the other hand, it's not much different than his song "Everybody Loves You Now" from Cold Spring Harbor back in 1971, only now he's got the girl. How satisfying it must be to write "because I'm her man" rather than "but you ain't got the time to go to Cold Spring Harbor, no more." Billy on "That's Not Her Style" and the photo shoot, from SiriusXM. Alternative publicity photo for "That's Not Her Style"
"That's not her style I can tell you because I'm her man . . . "
​ "That's Not Her Style" was the fifth single released from the "Storm Front" album and reached #77 on the Billboard charts. 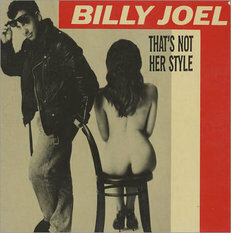 Although not a big hit, it's a fun rocker with a catchy chorus "that's not her styyyyyle." As with many Billy Joel's harder or bluesier songs, it sounds much better live (see video, right). Crystal Taliefero does a great job strutting and vamping to the song in the video, from Live at Yankee Stadium in 1990. These days, however, Billy rarely performs the song in concert. ​ Richard Marx (who had a string of top hits in the 80s and 90s like "Right Here Waiting") provides background vocals on "That's Not Her Style" and "Storm Front." He also recorded a cover version of Billy's "Miami 2017" from Turnstiles. Billy played piano on Marx's "I Get No Sleep." Fan video for "That's Not Her Style" featuring photos of models and celebrities. Live performance of "That's Not Her Style" from Live at Yankee Stadium (1990). © 1990 Sony Music Entertainment.